Bank Street Lodge has two different types of accommodation to offer including dormitory style rooms for the traveller on a budget and en-suite double/twin and family rooms of varying sizes offering superb value for money accommodation. 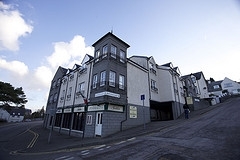 Situated right in the centre of Fort William, we are a 2-minute walk from the cinema, Tourist Information Office, pubs, restaurants and shops and very close to both the bus and train stations. Private car park, drying room, laundry service. fully equipped kitchen and dining area/TV lounge. Fully centrally heated. All bed linen and duvets provided.